This is a follow up to the posting on October 15th where I posted the first 4 reflections on Lauddato Si. They are prepared in both English and French. The second set of 4 have been prepared. These are done by African Europe Faith Justice Network See French and English The website is a great resource with a spirituality and action emanating from faith and justice. These refection are very helpful if you are following the Climate Conference that will be held in Paris at the end of the month. E 5 invites us to look at nature with different eyes and recognise the unique beauty and dignity of each creature which, by its very existence, praises God and gives joy to humanity. E 6 reflects on Pope Francis’ development of a new and profound theology of creation which looks at human beings as part of nature and as God’s responsible co-workers in creation. There can be no well-grounded ecology without a sound anthropology. E 7 notes that nobody has definite answers to the many open questions how to control climate change or how to shape a truly sustainable development for all. Pope Francis in his Encyclical ‘Laudato Si’ does not offer final solutions to these huge problems. He rather invites all stake holders to enter into a transparent interdisciplinary dialogue and to search for ways out of the crisis leaving aside all particular group interests but focussing on the global common good. E 8 reflection has reference to the Parish Climate Summit. The numerous climate summits in the last 20 years have not succeeded to reach a binding agreement for all countries which defines ‘common and differentiated responsibilities’. Pope Francis sees the reason for this in a lack of ethics in international relations, the fight for national interests to the detriment of the global common good, the lack of effective international institutions and the dominance of the financial markets over politics. Will the Paris Climate Summit pick up the challenge and live up to its responsibility to future generations? A background to previous conferences can be followed in this Primer prepared by IBON. 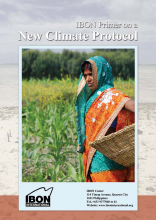 Here is the direct link IBON Primer on a New Climate Protocol There are 87 pages with 5 Chapters. The topics are interesting and some of the jargon we hear and read in the media is explained. The first Chapter reviews Climate Change the Long-term View. Chapter 2 looks at the Rio Mandate and the Koyoto Protocol. Chapter 3 is interesting creating awareness of False Climate Solutions. Chapter 4 has a draft of the Paris Climate Treaty and the last chapter presents some Real Climate Solution. This entry was posted in Climate Change, Climate Justice, Laudato Si and tagged Climate Change, Laudato Si.